Your trust is very important to Askonas Holt and we take data protection very seriously. Unless specified differently below, data is kept indefinitely, and for as long as Askonas Holt continues to operate in its current form. As is required by law, we keep all financial and business records for a period of six years. All deletion of data will be done in a timely and secure manner, whether electronic or hard copy. Hard copy data will be destroyed using a confidential waste service or a shredder. Under no circumstances will any personal or confidential data be disposed of in any other manner. Records of disposal will be maintained, recording the document disposed of, date and the individual responsible for authorising the disposal. There will be some cases where it is essential for us to keep some of your personal information on file; for example, if you ask us to stop sending direct marketing communications to you, we will keep the minimum amount of information (e.g. name, address or email address) to ensure we adhere with such requests. We gather information including IP addresses, system configuration information, URLs of referring pages, errors, and locale and language preferences to store in log files on our server. This allows us to keep track of any errors on the site and to provide a better service. It does not enable us to identify individual users. We send information about similar products and services to people and organisations with which we have done business, to provide them with relevant information. This includes email newsletters and our magazine, The Green Room. We will never sell your data to a third party, and you are able to unsubscribe at any time using the ‘unsubscribe’ link in the footer of the email, or by contacting us. We keep a record of the emails we send you and may track whether emails are opened or engaged with, so we can make sure we are sending you the most relevant information. As part of the services offered to you through our website, the information we collect on website users may be transferred to countries outside the European Economic Area (EEA). For example, if any of the computer servers used to host the website are located in a country outside of the EEA. Regardless of where the data is stored, we are committed to ensuring it is kept safe and secure. Please read our WEBSITE TERMS & CONDITIONS. In order to make the necessary arrangements for any engagement or project, and to fulfil the terms of contracts for artists and/or touring partners, we will hold and process data on all artists, touring partners, their members and associates, as provided by the artist or touring partner. We will pass data on to a third party only as is necessary to fulfil our contractual obligations. In addition, we are required under UK company law to keep your basic personal data (name, address, contact details) for a minimum of six years from the end of the financial year following the date of each financial transaction. By submitting your CV to Askonas Holt, you consent to us processing your personal data (including any sensitive information you may choose to provide such as ethnic origin, religious beliefs, criminal records and any medical conditions). Any information submitted to us is treated in complete confidence and in accordance with all legal obligations. We will keep your CV for a period of six months, after which we will delete your personal data from our systems unless we believe in good faith that the law or other regulation requires us to preserve it. Askonas Holt will hold as much personal data on file as is necessary for the purposes of managing your Contract of Employment, to comply with our legal obligations and/or for both of our legitimate business interests. If the Company needs any personal data (including that which may be sensitive) that is not necessary for managing your Contract of Employment, our legal obligations, or for our legitimate business interests but is nonetheless reasonable to request, then explicit consent will be sought. We will occasionally be required to pass some of your data to third parties, for example, when providing a reference to future employers, but will only ever share what is necessary. We regularly review and, where necessary, update our privacy information and terms and conditions. Such variations shall become effective immediately upon the posting on the website. This notice was last updated on 24 May 2018. Askonas Holt Ltd is registered in England with registered no. 3385237. 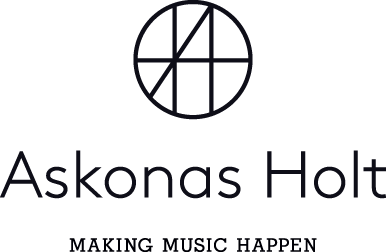 Askonas Holt Ltd is a member of the International Artist Managers’ Association.